The Human Performance Improvement process is very similar to Human Performance Technology. HPI provides you with a systematic process to follow on what can often be a not-so-systematic path. In addition to identifying human performance gaps and their possible solutions, this standardized approach offers the ability to measure the success of your efforts and eliminate the guesswork that follows when a performance gap must be evaluated. HPI is results-based and systematic. Rather than focusing on a ‘wants-based’ or ‘needs-based’ approach, HPI follows a ‘results-based’ approach to improving performance, distinguishing it from many HRD (human resource development) activities. The process is driven by a business need and a performance need, justified by the results of a cause analysis. The Human Performance Improvement process is very similar to Human Performance Technology. HPI provides you with a systematic process to follow on what can often be a not-so-systematic path. In addition to identifying human performance gaps and their possible solutions, this standardized approach offers the ability to measure the success of your efforts and eliminate the guesswork that follows when a performance gap must be evaluated. The HPI process helps you to articulate your business goals, link these goals to human performance, diagnose the current state of performance in the organization, find the root causes for performance deficiencies, implement solutions, and evaluate the results of the interventions. Being business focused means having a clear understanding what your organization’s strategic priorities are and using those priorities to guide your management decisions. The process of analyzing performance begins with a analyzing your business, which allows you to focus on the goals for your business. While you may believe that your business goals are clear and understood by everyone within your business, this assumption is often wrong. If your business is typical, most of your employees will have difficulty stating what your business goals are and identifying how their work assignments affect those goals. In a large and complex organization, there are usually a variety of business goals at different levels of the organization. Performance by individual’s results in output for your business or organization, but HPI begins at the end of the process, considering the business output or goals of the business, and then applying those goals backwards to the departments, teams, and individuals who will work towards satisfying those goals. The process of identifying your business goals is critical to applying HPI to your business. Quantitative, meaning you should have a definite understanding of when the goals have been met, and time limited, meaning that you have a definite schedule when you can ascertain whether the goal has been achieved. Individual Performance and Business GoalsPerformance by individual’s results in output for your business or organization, but HPI begins at the end of the process, considering the business output or goals of the business, and then applying those goals backwards to the departments, teams, and individuals who will work towards satisfying those goals. The process of identifying your business goals is critical to applying HPI to your business.Once you have identified your goals, it’s important to verify that you have set a realistic target. Your business goals should be:Quantitative, meaning you should have a definite understanding of when the goals have been met, and Time limited, meaning that you have a definite schedule when you can ascertain whether the goal has been achieved. The process of analyzing performance always begins with business analysis, which allows us to identify the gaps in performance. HPI takes into account the Influences that affect your business, the Tasks that form the daily workload in you business or departments, the Processes that are needed to deliver the Outcomes desired, and the final Goal that your business seeks to satisfy. The difference between the beginning point (current performance level) and the endpoint (desired performance level) is the performance gap. 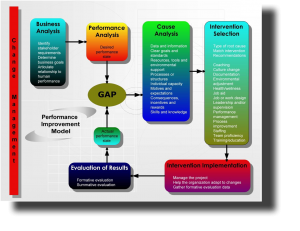 The first step in Gap Analysis is to determine your business goals and clarify the relationship of the goals to the performance your employees’ performance. The HPI analysis must start by identifying the key business goals, and then consider the performance gaps that can be addressed to help your business work towards those goals. Once you have determined what organizational goals are not being met because of a performance gap, you can take steps to close that gap. This will result in the desired performance state. Figuring out what has caused those gaps. Note that although you may have identified a performance gap, it doesn’t mean it’s worth closing that gap. The best value to your business is to focus on performance gaps that will make an impact in reaching your business goals. How important is the identified gap? How often does the gap occur? How costly will it be to resolve the gap? It is important to understand what your goals are, and to see how the steps you are undertaking will work to complete the goals. It is critical to suspend solutions until the true root cause(s) is identified. We do not presume that training is the solution for a given performance gap. Cause Analysis is used to determine why the performance gap exists, then we chose the most effective intervention. Cause analysis starts at the end of the business process, identifying the goals of your business and then identifying the contributions of the departments, units, and individuals that produce the outcomes that satisfy those goals. 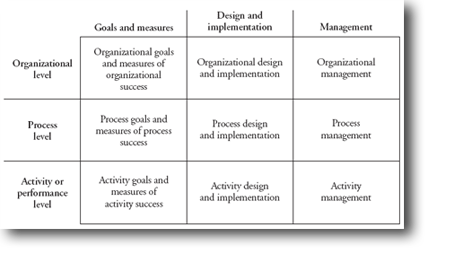 Once the goals and outcomes have been identified, Cause Analysis considers the processes that produced the outcomes, the tasks that make up the processes, and finally the initial influences that affect the accomplishment of each task. Lack of capacity by an individual to perform, due to poor hiring practices, selection practices or promotion policy. Observation is a powerful method of identifying key performance, because it enables you to see how one employee or department has better results than another employee or department. This is a similar process to identifying what the core competencies are within your business. Records review (e.g. performance appraisals, hiring process, maintenance records, etc. One of the cornerstones of HPI is the concept of systems thinking. Organizations are complex systems! Taking a holistic view of the entire system is critical if performance improvement is to be achieved. Merely tweaking various parts of the system will yield only marginal or unsustainable results. Geary Rummler and Alan Brache have defined the three levels of performance, along with the three factors that determine effectiveness at each level.